Child of God is a 2013 American crime drama film co-written and directed by James Franco, and starring Scott Haze, based on the novel of the same name by Cormac McCarthy. It was selected to be screened in the official competition at the 70th Venice International Film Festival and was an official selection of the 2013 Toronto International Film Festival. The film made its United States premiere at the 51st New York Film Festival and then was screened at the 2013 Austin Film Festival. Set in mountainous Sevier County, Tennessee, in the 1950s, Child of God tells the story of Lester Ballard. Ballard is a dispossessed, violent man whom the narrator describes as "a child of God much like yourself perhaps." Ballard's life is a disastrous attempt to exist outside the social order. Successively deprived of parents and homes, and with few other ties, Ballard descends literally and figuratively to the level of a cave dweller, as he falls deeper into madness, crime and degradation. 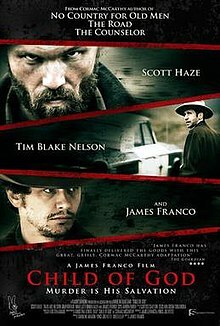 On September 14, James Franco announced at the 2011 Toronto International Film Festival that he was set to direct an adaptation of Cormac McCarthy's third novel Child of God. In January 2012, it was announced that Scott Haze had signed on to play Lester Ballard, the film's protagonist. It was also announced that Tim Blake Nelson and Jim Parrack had signed on to play Sheriff Fate and Deputy Cotton, respectively. Production on the film began on January 31, 2012, in West Virginia. The film received mixed to negative reviews, holding a rating of 38% on review aggregator Rotten Tomatoes. The critical consensus states: "An obviously reverent adaptation that fails to make a case for the source material being turned into a movie, Child of God finds director James Franco outmatched by Cormac McCarthy's novel." ^ "Venezia 70". labiennale. Retrieved July 26, 2013. ^ "Venice film festival 2013: the full line-up". The Guardian. London. July 25, 2013. Retrieved July 26, 2013. ^ "The 2013 Austin Film Festival Announces 20th Anniversary Film Lineup" (Press release). Austin Film Festival. September 17, 2013. Archived from the original on September 24, 2013. Retrieved November 30, 2013. ^ Cox, Gordon (August 19, 2013). "New York Film Festival Unveils Lineup". Variety. Retrieved November 30, 2013. ^ Dew, Blake (September 15, 2011). "James Franco To Direct Cormac McCarthy's Child Of God". We Got This Covered. Retrieved November 30, 2013. ^ a b Dew, Blake (January 25, 2012). "James Franco's Child Of God Begins Filming Next Week". We Got This Covered. Retrieved November 30, 2013.